Panasonic’s new rugged 5” handheld tablets are now available through BlueStar, Your Solutions Distributor. 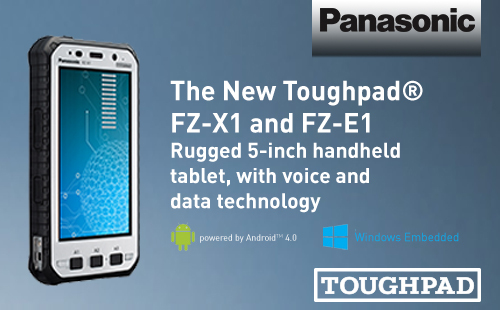 The new FZ-X1 and FZ-E1 rugged handheld tablets are raising the bar when it comes to Mobile Handheld Computing. These units include many features that make it an easy choice for any environment. Whether you choose the X1 and its Android operating system or the E1 with embedded 8.1 Windows, resellers will be confident they have made a solid choice for handheld solutions. With IP65 and IP68 ratings, these handhelds can withstand 10’ drops on concrete and can even take a swim and stay submerged in 5’ of water for 30 minutes. The operating range for temperature can go from -4 degrees to 140 degrees Fahrenheit; and for those really cold extremes, the unit even has a built in heater for the battery which is hot swappable to allow users to continue operating without service interruption. However, you may not even need to swap the battery since you will get 14 hours of continuous data access from a full charge. Does your solution need connectivity? No worries with the FZ-X1 and FZ-E1 as they are both capable of carrying two carriers SIM cards simultaneously to let the user switch between Verizon and AT&T networks. Barcodes and RFID: Better Together? Come See Us in 2017!